country by both area and population. 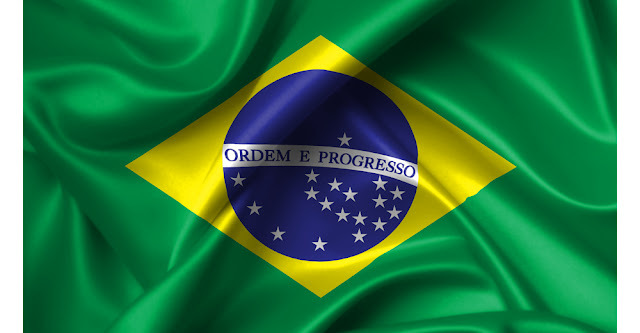 The official name is the Federative Republic of Brazil. Located in eastern South America along the Atlantic Ocean, Brazil borders Argentina, Bolivia, Colombia, French Guiana, Guyana, Paraguay, Peru, Suriname, Uruguay, and Venezuela. Brazil's natural resources include gold, iron ore, nickel, phosphates, tin, platinum, uranium, petroleum, bauxite, and manganese. As of 1 January 2016, the population of Brazil was estimated to be 208,846,074 people. Brazil occupies 47.3% of South America and covers 3 time zones. Brasília, inaugurated as Brazil’s capital in 1960, is a planned city distinguished by its white, modern architecture, chiefly designed by Oscar Niemeyer. It is a masterpiece of modernist architecture listed as a World Heritage Site by UNESCO. The largest city in Brazil is Sao Paulo. Other major cities include Rio de Janeiro, Salvador and Fortaleza. The highest point in Brazil is Pico da Neblina at 2,995.3 meters (9,827 feet) above sea level. The coastline of Brazil measures 7,491 kilometers (4,655 miles), which makes it the 16th longest national coastline of the world. A considerable number of geographical features can be found all through the coastal areas, like islands, reefs and bays. The beaches of Brazil (2095 in total) are famous in the world and receive a great number of tourists. Copacabana is a bairro (neighbourhood) located in the South Zone of the city of Rio de Janeiro, Brazil. It is known for its 4 kilometers (2.5 miles) balneario beach, which is one of the most famous in the world. Ipanema shares a border with Copacabana, but this world-class beach destination is more poised than its south Rio counterpart. Like a samba that swings so cool, this neighborhood is known for culturally enriching contributions and nonstop parties. One of Brazil's most famous attractions is Rio Carnival. It is a major celebration that can take a year to prepare for and it attracts a large number of tourists every year. Brazil has around 70 national parks and 19 UNESCO World Heritage Sites. Christ the Redeemer is a statue that was built as a symbol of Brazilian Christianity. The statue has also become a cultural icon of both Rio de Janeiro and Brazil, and is listed as one of the New Seven Wonders of the World. The Harbor of Rio de Janeiro is located in Brazil and was created by erosion from the Atlantic Ocean and is also known as Guanabara Bay. It is one of the Seven Natural Wonders of the World. The exquisite Iguazu Falls are also known as the Iguassu Falls and the Iguaçu Falls. The magnificent spectacle of these 275 individual drops has awed tourists, locals and indigenous inhabitants for centuries. They originate from the Iguazu River and are located on the border of Brazil (in the state of Paraná) and Argentina. The Amazon River, over half of which lies within Brazil,the largest river by discharge of water in the world, and the second in length. It is 3,977 miles (6,400 km) long and during the wet season it can become over 48 kilometers (30 miles) wide. Approximately 60% of the Amazon Rainforest is located within Brazil's boundaries. Brazil's capital city is Brasilia and its largest city is Sao Paulo. The Amazon Theatre is an opera house located in Manaus, in the heart of the Amazon rainforest in Brazil. It was assembled in 1896 from panels shipped from overseas. It has an iron frame built in Glasgow, Scotland; 66,000 colored tiles from France; and frescoes painted by the Italian artist Domenico di Angelis. One of Brazil’s most famous attractions is Rio Carnival. It is a festival held before Lent every year and considered the biggest carnival in the world with two million people per day on the streets. The first festivals of Rio date back to 1723. Of all Brazilian music styles, samba is undoubtedly the best known. Both abroad and in Brazil, samba has become a symbol of the Brazilian nation and its people. Modern Samba music dates from the 19th century when the crude tones of the slaves met with the stylized European sound of Rio de Janeiro. Brazil derives its name from brazilwood tree. In Portuguese brazilwood is called pau-brasil. On Brazil’s modern flag, the green represents the forests of Brazil, the yellow rhombus reflects its mineral wealth, and the blue circle and stars depict the sky over Rio de Janeiro on the morning of November 15, 1889, when Brazil declared itself a republic. Across the blue circle is a white banner that reads, “Ordem E Progresso,” that translates in English to Order and Progress. Brazil has more than one national animal. They are the Jaguar, the Macaw and a Rufous-Bellied Thrush. Football is the most popular sport in Brazil with the national team consistently among the best in the world, winning the World Cup a record 5 times. The 2016 Olympic Games in Rio de Janeiro, Brazil, will be the first time a South American country has the right to host them. Brazil’s economy is the world’s 7th-largest by GDP as of 2015. Brazil has been the largest producer of coffee for the last 150 years. Brazil has the 2nd highest number of airports in the world, after the U.S.
Brazil is the world’s first country to ban tanning beds. There’s an Island in Brazil where civilians are forbidden to go: it has up to 5 snakes per square meter (10 square feet). Indonesia has the world’s highest rate of deforestation, with Brazil as a close second. 4% of Brazil's rainforests are being destroyed each year because of ranching, logging, and slash-and-burn agricultural practices. Brazil’s Capital, Brasilia, looks like an aeroplane from above. The name Brazil originates from a tree called the brasilwood. It is a dark rosewood tree that was originally Brazil's main export. Exporting Brazilian rosewood is now illegal. Rio de Janeiro was once the capital of Portugal, making it the only European capital outside of Europe. Logging, mining and agriculture are a serious threat to Brazil's environment. There’s a prison in Brazil that allows inmates to pedal stationary bicycles, providing electricity to a nearby city in exchange for reduced sentences. Brazilian prisoners can reduce their sentence by 4 days for every book they read and write a report on. Brazil was the only independent South American country to send ground troops to fight in WW2, with over 25,000 soldiers. There’s a 10,000-seat replica of Solomon’s Temple in Sao Paulo, Brazil. Soccer is Brazil's most popular sport. The largest population of Catholics in the world is in Brazil: 123 million, 64% of its population.